An interview with Jane Lewis for Vegan Wisdom Blog. Jane Lewis discusses how her awareness of animal rights has significantly changed her artistic ideas. VW: How did your vegan journey begin? JL: I’ve been vegan just over three years, since early 2015, after watching the documentary film Earthlings. I had already given up dairy 30 years ago because of allergy rather than ethics, and I had also been vegetarian for a while but, while still avoiding dairy, I had eventually lapsed to eating fish then meat again. I came across the Earthlings page on Facebook and wondered what the film was about, found it on YouTube and watched it from a totally naïve perspective, completely unprepared for its content. Seeing that film changed my life - I became vegan overnight. At first I only changed my eating habits, but veganism is a process where I came to realize that almost every aspect of human activity revolves around the exploitation of other animals, and so I had to consider what my clothes are made of, whether the toiletries and cleaning materials I use are tested on animals, and now I also try to avoid as much plastic packaging as I can because trash single-use plastic injures, poisons and kills uncountable numbers of animals besides polluting the environment. VW: When did you first start bringing your art and veganism together? JL: At first I continued to work with subject matter that had previously interested me. But eventually I felt a nagging unease between what I was painting and the burning passion for animal rights that was in my heart. The terrible plight of animals in our human-centric world claimed centre stage in my work, and veganism significantly changed my artistic ideas and my attitude to exhibiting. In 2016 I began work on a series of drawings entitled Earthlings, and now in 2018 I have completed 17 images with a final 18th image in the pipeline. They depict many aspects of animal exploitation and suffering, from farm animals to animals used in medical research to those needlessly killed in hunting. The drawings are highly finished and give an impression of elegance and calm which belies their content. My intention is to arrest and seduce the viewer, then confront with challenging and disturbing subject matter. I have also completed other animal rights works in oil painting which are larger and more complex in composition. Two are concerned with vivisection, and treat the subject in a surreal manner which is intentionally both intriguing and subversive. I had a long career showing with a central London gallery, and had success with solo exhibitions, sales and commissions. Now I have reached a mature point in my career and want to find a wider, alternative audience by sharing my animal rights images on social media and occasionally opening my studio to the public. Both are ways of reaching a far wider audience than through an exclusive commercial gallery. The only gallery I continue to exhibit with regularly is the Nicholas Treadwell Gallery in Vienna, where it is possible to show work that is outside the mainstream. Treadwell says that I do my best work when I am angry. VW: Why do you think creativity is such a powerful tool when starting conversations about veganism? JL: I have had a great deal of positive response to my animal rights work, which at first surprised me. Other vegans are supportive of this kind of artivism, and non-vegans who would otherwise refuse to look at photographic and video evidence of animal use and abuse find my images more approachable. From there I am able to explain that my ideas are based on fact, which encourages the viewer to question his/her own preconceptions and denials. VW: Why do you think people can connect more deeply to animals through an artistic spectrum rather than talking about them? JL: An image can remain in the memory more vividly and precisely than a conversation. Many people think that they are not interested in visual art, but it is in fact all around us in one form or another whether they realize it or not. The modern world is dominated by images, and artists can infiltrate this image-based culture with political and revolutionary ideas. Once when I posted one of my Earthlings drawings on social media someone commented that it made her gasp. I believe part of my role as an artist is to make people gasp, and to leave a memorable visual imprint on people’s consciousness. The truth of animal abuse and suffering can be told through allegory or the surreal, it doesn‘t need to be literal, but it must be true. VW: Tell me a bit more about your paintings. Do you have any specific themes or narratives? How does colour affect the outcome of your paintings? JL: Surrealism has long influenced my work. Its presence persists as a kind of intuition when I paint. My subject matter has always been outside of the contemporary mainstream. Currently I feel it is important to express the radical and political through art even if it makes exposure of one’s images in the conventional art world more difficult. At the moment all my ideas are to do with animals and veganism, and until there is positive change in the world I see no reason to alter the narrative of my art. My use of colour has not changed - I use what are called earth pigments which have a long tradition in painting. 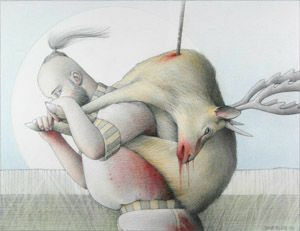 But there is rather more red than before, unfortunately because I am often depicting bloody injuries to animals. VW: What are some of your most powerful works? JL: Two paintings come to mind. One, recently completed, is an oil painting called Vanitas. The title comes from the saying: vanitas vanitatum omia vanitas (vanity of vanities, all is vanity). The image appears to be representational and realistic-looking, but there is a disturbingly surreal edge to it, and it deals with the horrors of vivisection. There is a double image of a woman, seen from the back and also from the front in a mirror reflection. She holds an animal-like mask over her face which is smeared with blood, and we see that she has blood on her hands and smeared on her neck. The implication is that because of her vain demand for toiletries, make-up and drugs tested on animals, she literally has blood on her hands. Beside her are two rats and we see the tail of another hidden rat. Several heads of rabbits emerge from holes in a doll-house-like container which is reminiscent of the ’stocks’ in which rabbits are incarcerated for medical research. One of the rabbits is badly mutilated, and small rodent hands are pressed against the glass of tiny doorways. An empty cage is suspended on a string behind the rats, for their confinement later on. The other painting, also in oil, is called White Rabbit -The Vivisectionist. A human figure (the vivisectionist) is disguised by a mask, because the perpetrators of torturous experimentation on animals are frequently made anonymous by surgical masks or pixilation in video footage and photographs. In a blood-stained shirt he/she is surrounded by some of the many types of animals used in vivisection. I had in mind not a laboratory, but a less clinical interior where perhaps the vivisectionist is at home and indulging in a costumed ritual of his/her sadistic practices. So we see a cat with embedded electrodes on a windowsill with only a ball of sky for distraction. The human’s hat has a pattern of monkey faces and is festooned will floating eggs on which the word vaccine can be read (most vaccines are incubated in chickens’ eggs) and the decorative stained-glass roundel held in his/her hand depicts fish, which are also used in animal experiments and it is blood spattered. The white rabbit of the title is at first sight a toy, but one that has been wounded and stitched, and a white rat is held in restraint by the tail. Another telling detail is the triangular piece cut from the table top to reveal the eye of a captive animal. As in all my work, both paintings aim to intrigue and then challenge the viewer. VW: What conversations do you hope your paintings will generate? VW: How do you think veganism will develop in the future? Do you think more organisations and companies will support the vegan movement? JL: I believe that the future is vegan. It has to be or there will not be a future for life as we know it. Change will come about not from government but from the grassroots, from people living compassionately and ethically and demanding products and lifestyles that are not dependent on the death and suffering of other animals. I’d like to see a time when the kind of work I am doing now is redundant, just a terrible reminder of an appalling time in history. VW: What has been the most positive outcome from your paintings? JL: I love the positive and supportive feedback my work receives through social media. It is wonderful to know that my art and its message has an impact, however small, that is worldwide. VW: Thank you so much, Jane!